The Charters of Freedom monument replicates the display for the Declaration of Independence, U.S. Constitution and Bill of Rights as they are done at the National Archives in Washington, D.C. The three displays exhibit the Declaration of Independence on the left, the Constitution (four pages) in the center and the Bill of Rights on the right. The center display measures 12’ x 4’ x 3.5’ to 4.5’ and the side displays measure 4’ x 4’ x 3.5’ to 4.5’. The rear of the left display has a Charters of Freedom information plaque and the right rear display contains a dedication plaque. The rear of the center display holds a time capsule with a description plaque. There are two small plaques on the front edge of the center monument – one says “We The People,” and the other lists the names of the North Carolina Representatives who signed the Constitution; John Penn, Joseph Hewes and William Hooper. These are raised lettering to allow school children to do rubbings. Incised in the stone on each display is its name; DECLARATION OF INDEPENDENCE, UNITED STATES CONSTITUTION, BILL OF RIGHTS. The center display has the Charters of Freedom seal on a front panel. The granite and glass displays were built to last 300- 500 years. 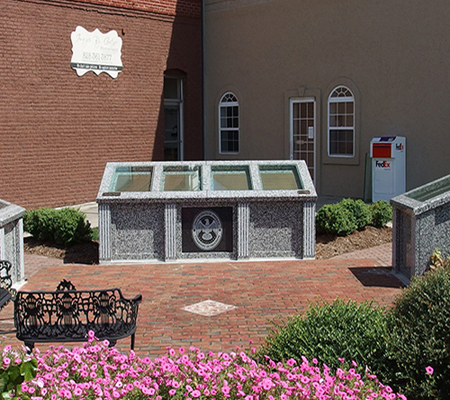 The time capsule at this monument along with others in North Carolina and across the country will be opened concurrently on September 17, 2087 – the 300th Anniversary of the U.S. Constitution. Information Plaque: THE CHARTERS OF FREEDOM / THE ORIGINAL CHARTERS OF FREEDOM ARE ON / DISPLAY IN THE ROTUNDA AT THE NATIONAL / ARCHIVES IN WASHINGTON, D.C. THE BILL OF RIGHTS WAS PROPOSED SEPTEMBER / 25, 1789, AS 12 AMENDMENTS; TEN WERE / RATIFIED DECEMBER 15, 1791. THE REMAINING / TWO WERE NOT RATIFIED BUT APPEAR ON THE / ORIGINAL DOCUMENT. THESE FIRST TEN / AMENDMENTS RATIFIED ARE OUR BILL OF RIGHTS. The dedication plaque shows the date of July 12, 2014, but the formal dedication ceremony was held on Constitution Day, September 17, 2014. The foundation is reinforced, poured concrete. The structures are reinforced, poured concrete covered with four inch thick polished granite. Each of the six documents is one quarter inch thick etched bronze weighing over 60 pounds. Charters of Freedom Monuments are being placed across the United States by Foundation Forward, Inc. The foundation’s goal is to provide educational resources to children and citizens in the communities in which Charters of Freedom have been placed. The idea that evolved into Foundation Forward began on May 3, 2012 while Vance and Mary Jo Patterson were attending the National Day of Prayer meeting being held at the on the Old Burke County Courthouse Green in Morganton. The idea came to Mr. Patterson to try and duplicate his experiences when he and his wife had viewed the Declaration of Independence, Constitution and Bill of Rights on a visit to the National Archives. He determined to bring that experience to the citizens of Burke County. The first monument was dedicated on July 2, 2014 at the Old Burke County Courthouse. Several dozen additional monuments have since been placed or are planned across North Carolina and in at least nine other states. Among already dedicated Charters of Freedom monuments are memorial complexes in Buncombe and Burke counties. The memorial complex is located at the intersection of River Valley Avenue (Business US 19) and Peachtree Street in Murphy, NC. The memorial is on the left when traveling west on River Valley Avenue which changes names to Hiwassee Street at this same intersection. The memorial complex stands in a small park like area with trees and bushes, a small patch of grass and brick patio with buildings on either side. The monument is an educational resource for local schools, patriotic and religious celebrations and thoughtful contemplation.